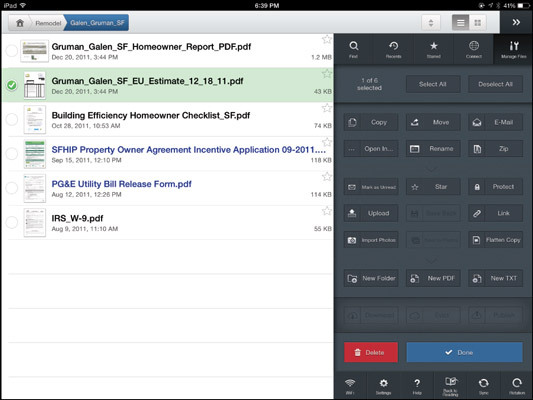 You can use GoodReader to move work files using your iPad. iOS doesn’t have a file system that you can access, meaning there’s no way to get lists of files on the device, as you can in Windows’ File Explorer, OS X’s Finder, and Android’s various folders such as Downloads and Gallery. Instead, iOS locks files inside the same “container” that holds the app. This means that each app stores all the files it works on, keeping them securely separate from other apps. But because practically every device has a file system, many people want to replicate that aspect in iOS. The $9.99 GoodReader can act as a central file manager for iOS — sort of. It can connect to both cloud services and servers on your network, meaning computers, file servers, and even storage devices attached to your router. You can then move files between those network-accessible resources and GoodReader on your iPad. When you open GoodReader, you see a list of any files stored in GoodReader, organized by folders. Tap the Home button to go to the main GoodReader file list, and tap a folder to open its contents. You can open folders inside a folder the same way. As you navigate the folder hierarchy, you see the path appear at the upper left of the screen; you can tap any folder in that path to move directly to it. Tap the Reveal Controls button (the « icon at upper right) to reveal GoodReader’s many controls. Tap Settings at the bottom of the controls. In the pop-over that appears, scroll down until you see the Use iCloud switch. Set the Use iCloud Switch to On. Tap Close to close the pop-over. To work with files, tap Manage Files at the top of the controls to see the options. Then tap Manage Files at the bottom of the Manage Files pane; selection bubbles should appear to the left of the files and folders in the left pane. Upload: Tap Upload to choose a server or cloud storage onto which to upload the selected items. Download: Tap Download to move a file from iCloud, other cloud storage, or server into the GoodReader app, in whatever folder is selected in the left pane. Open In: Tap Open In to open the Share sheet, from which you select which app to copy the selected file to. When you’re done with the selected files, tap the Done button in the Manage Files pane. So how do you get GoodReader to access those cloud storage services and network servers in the first place? You do that in the Connect pane, which you open by tapping the Connect button at the top of the controls in the right pane. The Connect pane has four main sections related to getting content from outside your iPad: Web, Downloads, Remote Sync, and Connect to Servers. The Web section has two buttons that let you find a website with files you want to download: Browse the web and Enter URL. The first button lets you use a primitive browser to go to websites and navigate within them to the files you want; the second button lets you enter the URL directly. The Downloads section lists all the files you’ve downloaded recently, and you can redownload any that were later deleted. Tap Show All to see the list, and tap the Refresh button next to an item in that list to redownload it. The Connect to Servers section is where you see all your servers. Tap Add to add a cloud service such as Dropbox or OneDrive, a WebDAV server, an FTP server, a Mac (called an AFP server), or a Windows PC (called an SMB server). You have to enter the appropriate credentials to sign in to the desired cloud service or remote server. There’s more! Scroll to the bottom of the Connect pane and tap Reload List of Local Servers. All compatible servers on the current network display in the Servers Found via Wi-Fi list, and you can tap any to sign in; then you navigate its folder hierarchy to find files. Tap the Pin button to the right of a server to have GoodReader remember it, which places it in the Known Servers list for easy access later. Tap the Settings button to the right of a server in the Known Servers list to enter your credentials for that server if you want GoodReader to sign in automatically the next time you open it. The Remote Sync section lists the folder that you have set to sync to GoodReader. You use the Sync button below a folder to start the sync, which makes the contents of the remote folder and the GoodReader folder be the same. Connect to the server via the Connect pane. In the pop-over that opens, navigate to the folder that contains the folder you want to sync. Tap that folder so that it’s highlighted. Tap the Sync button that appears at the bottom of the pop-over. Tap Proceed in the alert that appears. Select the folder within GoodReader that you want to synchronize that external folder to. You can also create a new folder. Tap Download Here & Synchronize to make that local GoodReader folder be the one that syncs with the remote server’s folder. Tap Close to finish the setup, or Sync to both finish the setup and immediately sync the two folders.